Getting a strong start in multi-cultural media 15 years ago, Doris is now one of the most sought-after media talents in the business. With her keen knowledge of the changing face of America, she skillfully lends her expertise to many fortune 500 companies and successfully launched their media campaigns targeting Asian Americans in the US. Today, back by a dynamic media team, Doris oversees media operations for all clients at Admerasia. 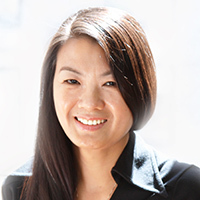 With her in-depth Asian media knowledge and innovative planning skills, Doris helped many major brands and product/services such as McDonald’s, Nissan, Infiniti, Lowes, West Union, etc. successfully launched their campaigns targeting Asian-Americans in North America. Over the years, Doris developed many “Media First” in the market place to better engage target consumers with high impact and how to maximize cost efficiency and effectiveness. Within the healthcare and pharmaceutical category, Doris lead the first Osteoporosis PD brand, Actonel, launch in the US targeting the top 3 Asian segments (C/K/V) nationally for 5 years. Other health/healthcare related clients also include Health First, United Health Care, HepB Awareness Campaign, NYU hospital, etc. Doris doesn't play any sports or go to the gym but consider shopping an ultimate exercise to maintain physical and mental health. She also enjoys good food and restaurants and spend time with her family. In addition, she enjoys traveling and one of her goals is to visit as many places as she can.